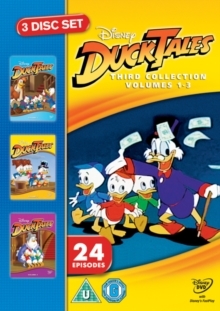 Three-volume set comprising a total of 24 episodes from the children's animated series. Scrooge McDuck has a nose for business that leads him to the far corners of the world but even this tycoon has his hands full when grandnephews Huey, Dewey and Louie follow him on his travels. Joined by their loyal pals, including Launchpad McQuack, Gyro Gearloose and Duckworth, the DuckTales gang never fails to deliver a wealth of adventure. In this instalment, the gang save Donald Duck from prison and help the rightful heir of an African kingdom take back his throne.